Whenever parents discuss buying their teenage kid's first car, a typical argument ensues. The teen believes they'll be perfectly safe in a rear-wheel-drive sports car like a Camaro or Mustang while the parents simply see dollar signs in the form of high insurance payments, speeding tickets, and an inevitable accident. If only there was a car with sporty styling to please teenagers (preferably a two-door coupe with a manual) but practical enough to keep parents (and insurance companies) happy. Well, such a car does exist but it has been off the market since 2017. Look no further than the Honda Accord Coupe. When Honda introduced the 2018 Accord, it ditched two of our favorite elements from the outgoing car - the coupe body style and the V6 engine. With two-door models like the Nissan Altima Coupe and Toyota Solara relegated to the history books, the Accord Coupe was one of the last mid-size coupes you could buy at a reasonable price. It may not have some of the features desired by enthusiasts like RWD, but unlike purpose-built sports cars, the Accord Coupe was spacious, practical, and affordable. 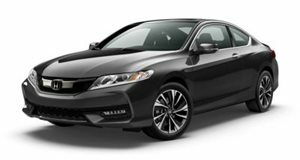 Since Honda introduced the Accord Coupe way back in 1988 for the third-generation model and offered it until 2017 in the ninth generation, there are tons of available models to choose from on the used market in almost any price range. Just pick your budget and there will undoubtedly be an Accord Coupe to suit it. Since the Accord Coupe lived such a long life, they exist at almost any budget. We found several fifth, sixth, and seventh generation models ranging from 1995 up to 2007 that are available for less than just a few thousand dollars. Prices stretch all the way up to almost $25,000 for low mileage, V6 models from 2016 and 2017. It appears as though later models have held their value incredibly well due to the fact you can no longer go out and buy a new Accord Coupe. Most Honda Accord Coupes were sold with a four-cylinder engine mated to an automatic transmission but Honda knew it could cater to an enthusiast crowd by offering a more powerful V6 mated to a manual box. Honda gradually increased the output of its V6 over the years, culminating in a 3.5-liter mill producing 278 horsepower and 258 lb-ft of torque. That's right, this front-wheel-drive coupe produces more power than several brand-new, entry-level sports cars including the Subaru BRZ and the turbocharged four-cylinder Chevy Camaro. At its peak in 2017, a manual Accord Coupe with the V6 could hit 60 mph in 5.4 seconds, which is quicker than an EcoBoost Mustang of the same year. Trust us kids, the Accord Coupe was seriously quick and will easily keep up with your friends whose parents bought them a new Subaru BRZ or Toyota 86. Inside, the Accord may not do anything too flashy to wow teenagers, but Honda always included minor details to help keep the cabin looking moderately sporty. Although it varies for each generation, we always enjoyed the simple yet sleek design of the Accord's gauge cluster. Some generations were even given pretty aggressive steering wheels and shift knobs that looked as though they belong on a Type R vehicle or an S2000. And unlike other coupes like a BRZ, Camaro, Mustang, or 86, the Accord Coupe actually has rear seats suitable for a normally-sized human being. Bundle this with a decently-sized trunk that can fold down into the cabin and the Accord Coupe easily becomes an ideal daily driver. Speaking of practical stuff, the Accord Coupe has plenty more of it in spades. The latest Accord Coupes feature Honda Sensing, a suite of safety features including adaptive cruise control, collision mitigating braking, and road departure warning. Honda also jammed in plenty of luxury features on higher trim levels such as heated leather seats, navigation, push-button start, and Bluetooth. Fuel economy does range depending on which engine and generation you choose but a 2017 EX model with a manual could achieve mpg figures of 18 mpg in the city and 28 mpg on the highway, which are not great by today's standards. No wonder why so many automakers are shying away from V6 engines. The Honda Accord has long been one of the best mid-size cars on sale because it matches the fabled reliability of the Toyota Camry but offers a more exciting driving experience. We wish Honda still built a coupe model but with so many used examples at affordable prices, it's hard for us to stay upset. If you have a teenager looking for a cool first car or are a teenager looking to convince their parents to get something better than a dismal beige crossover, take a look at a Honda Accord Coupe.